Awesome place to stay! The RV park is like new throughout. The pads are nice, long, level concrete pads, and all are pull through. Site are 20/30/50a, water, sewer, and cable. There Office, laundry,and latrines/showers are in the middle of the campground. A nice sidewalk with lights runs throughout the middle of the park to the office. Laundry was $1.50 to wash and $1.50 to dry (as I recall). The laundry room was nice. The restroom/shower room was really nice. The only thing I thought was strange is that Fort Huachuca has no librabry on post. I went to Army Community Service (ACS) to print when I need to. The Commissary was nice. Post Gym was very old, but they do the best they can with what they have. The Gymn has everything you would want... weights, all the standard cardio machines, racquet ball, swimming, and sauna. 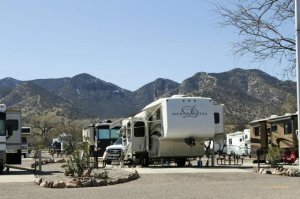 Fort Huachuca is a nice location to stay to visit the southern part of Arizona. I would absolutely stay at this facility again.